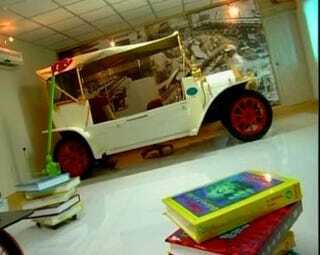 Hyderabad's most talented custom car builder, Sudhakar, just built himself a new office — inside a 1908 Ford Model T.
Sudhakar is the proprietor of a museum filled with his creations called SudhaCars. Sudhakar created the office from a Model T he picked up at a junkyard, the same place he found supplies for the rest of his creations. Since the car didn't have an engine, he converted the engine bay into a file cabinet. You may remember Sudhakar from such customs as The Snooker Table Car and the Condom Bike.